How vulnerable is our community to climate change? If you were asked this question, would you know how to answer? This journal is intended to help raise awareness of our vulnerabilities, and to start a dialogue about building resilience at the local level. Explore the presence of natural and technological hazards in your area of the county using this interactive National-Level Hazard Atlas. Explore what hazards exist near your community as you work on planning, preparedness, and mitigation efforts to increase your community’s resilience. Geospatial Preparedness – Now in Public Beta! Assess your agency’s geospatial readiness by completing an online self-assessment of your current capabilities. The new CARAT tool is being developed to guide you through an assessment, and to provide actionable recommendations that will help you progress in areas where you need it most. 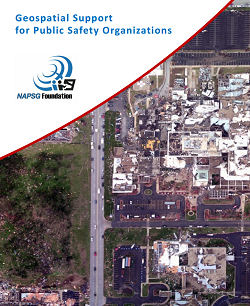 Monitor current events and severe weather forecasts using this dynamic Situational Awareness Viewer provided by NAPSG Foundation to support incident and disaster readiness across several natural hazards nationwide. For full access to the NAPSG SA Viewer visit: https://arcg.is/0imPXC.